Listed under 'B' as 'Benoist Crampel' in alphabetical list of members of Cercle des Echecs in Paris in Le Palamède, 1845, p.135; similar listed under 'B' as 'Benoît Crampel' in alphabetical list of members of Cercle des Echecs in Paris in La Régence, 1849, p.164. Given as 'Crampnel' in the Illustrated London News (11 Jan. 1851, p.32). Given as 'Benoit-Crampel' in Bell's Life in London (9 May 1847, p.8). Given as 'Crampell' in the Chess Player (10 Apr. 1852, p.120). 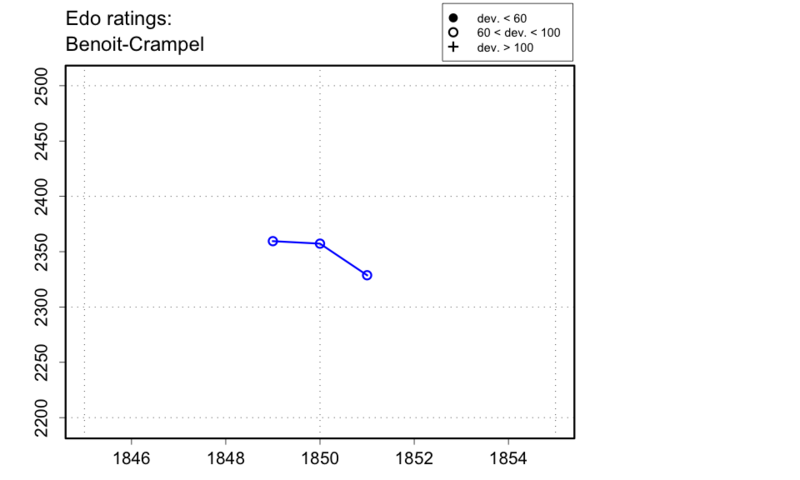 Given as 'Crampel' in Bell's Life in London (22 Apr. 1855, p.2) and La Régence (15 Feb. 1856, p.36).